Tom Guardia, Rob Sterling, Ralph Thompson and Dave Seim are enjoying the FDC rest area. Tom has 2 cases of peaches that were the most desired C-Ration food item and prime trade material. Fruit cocktail was number two. In a case of 12 individual boxes of rations, the maximum amount of both was 2 cans and usually 1, so demand far exceeded supply. Tom must have killed someone in base camp supply to acquire them. Dave and Tom’s civilian briefs are showing and its a sure bet they have jungle rot of the crotch from wearing them. 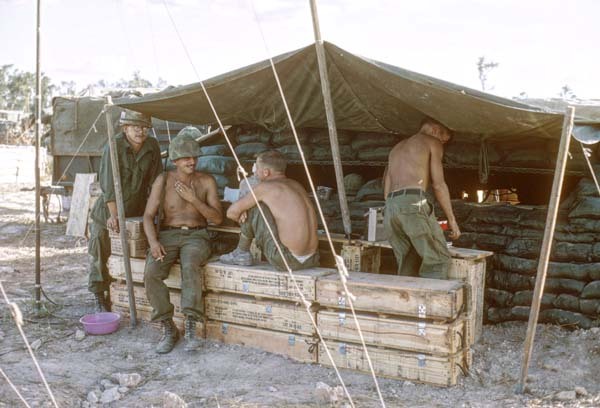 We were wet from rain or sweat constantly and cotton shorts would not dry, be they Army issue or sent from home. NOT wearing underwear was a big step from being civilized and deciding not to wear them took a severe case of raw skin. Today I have long scars on my inner thighs from my reluctant decision. Once the rot got hold it stayed, as there was no medical treatment available; at least none that worked.